My husband had to cut down a very large and much-beloved Chinese Pistache in our backyard this summer after it died from “tree girdling.” (Apparently that’s a real thing. Google it.) By the way folks, tree removal is not for wimps. I watched, apologetically, from the kitchen window while he chopped, and cut, and sliced, and chopped some more – for days – until he finally had the limbs, trunk and giant roots tackled. No small chore. Our daughter had begged her dad to cut some slices from the trunk so that she could count the “rings.” She was fascinated by all the gnarly knots and the wavy pattern inside. I was too. 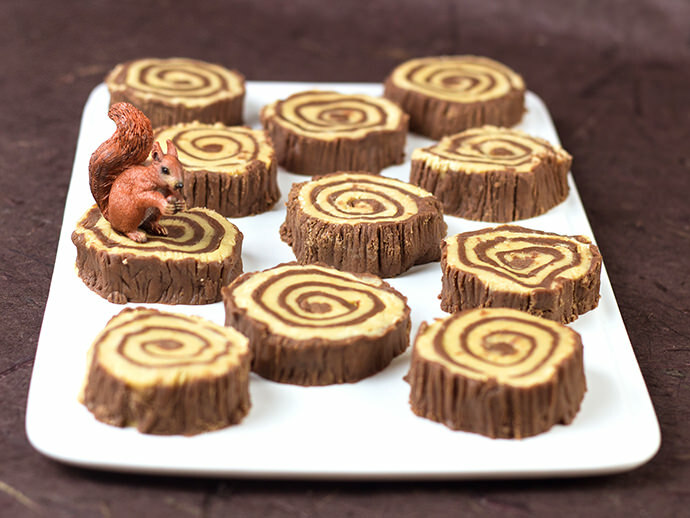 And since I felt so guilty about not being able to help much with the tree removal, I decided to make some fudge tree rings, to reward my husband for his hard work. My next attempt was much better, yielding finger-friendly slices and perfect-proportioned rings inside. 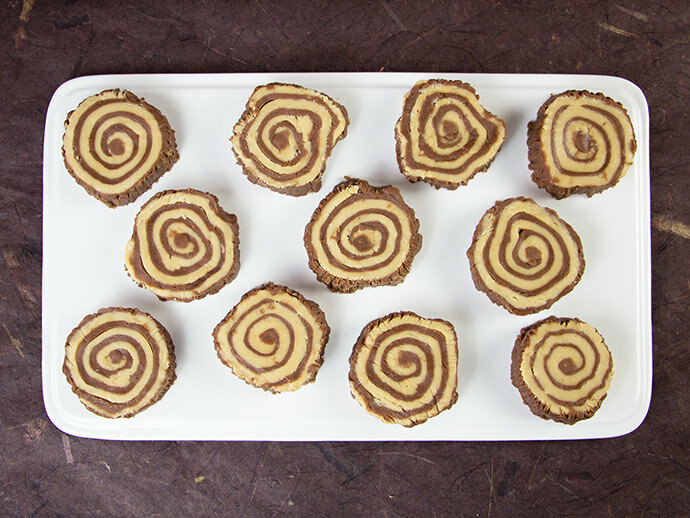 Helpful hint: the thinner you can roll out your fudge, the more rings you’ll get. It was fun to experiment and guess what the result would be when sliced. So, while we’re sad our tree is gone, it turned into an interesting nature lesson for our kids (as well as an example of hard work.) The tree didn’t go to waste either. We’ll use the branches this Halloween for spooky decorations on our front porch. And the trunk was cut up to make stump stools for our daughter’s nature fort in the backyard bushes. As for my husband, I think it’s going to take more than the promise of fudge to tackle another tree project like that. This recipe will make 20 slices of fudge. Gather your ingredients and supplies. Have everything pre-measured before you begin cooking. 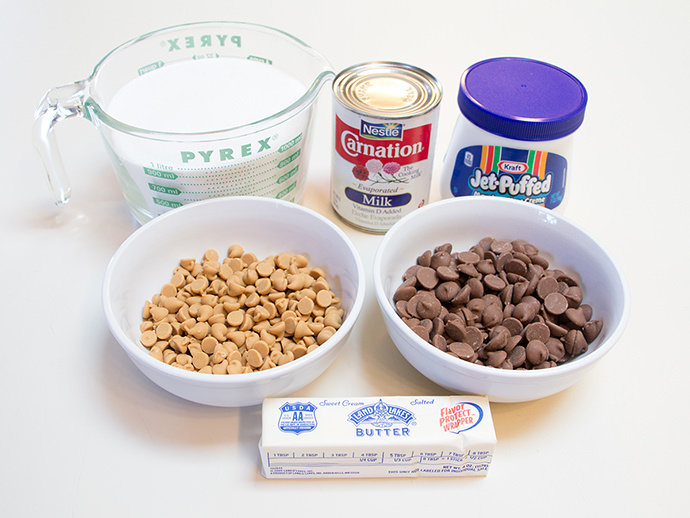 Put the chocolate chips and the peanut butter chips in medium-sized bowls. 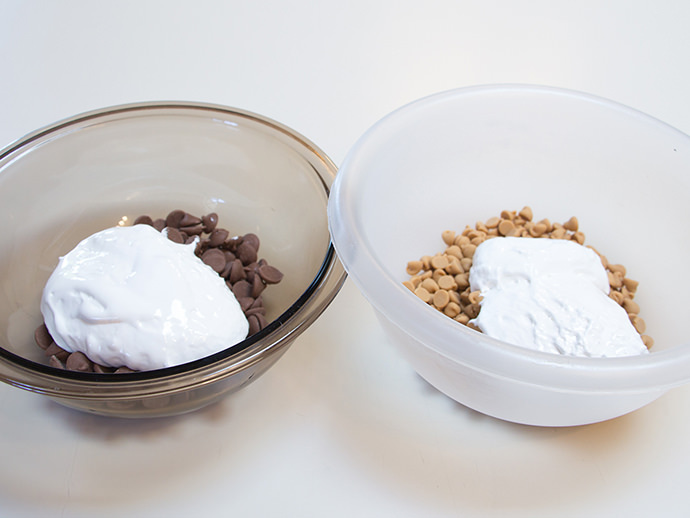 Add half of the jar of marshmallow cream to the chocolate chips, and the other half to the peanut butter chips. Set aside for later. Melt the butter in a large pan on the stove. Stir in the evaporated milk and sugar. 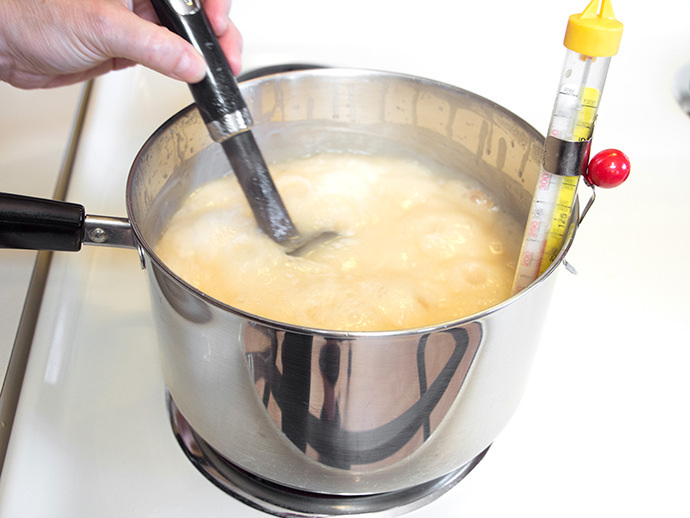 Bring to a boil and stir constantly, for about 10-12 minutes – until your candy thermometer reaches 234 degrees (soft ball stage.) Remove from heat. Pour half of the heated mixture into the chocolate chip and marshmallow cream bowl, and the other half into the peanut butter chip and marshmallow cream bowl. Stir each bowl thoroughly until all ingredients combine smoothly. Lay out four sheets of parchment paper. Pour two halves of each mixture onto the parchment papers. 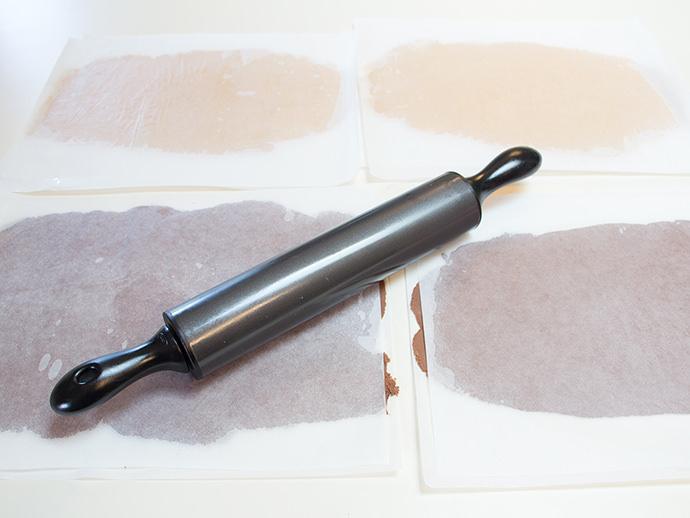 Cover each with another sheet of parchment paper and roll flat with a rolling pin. 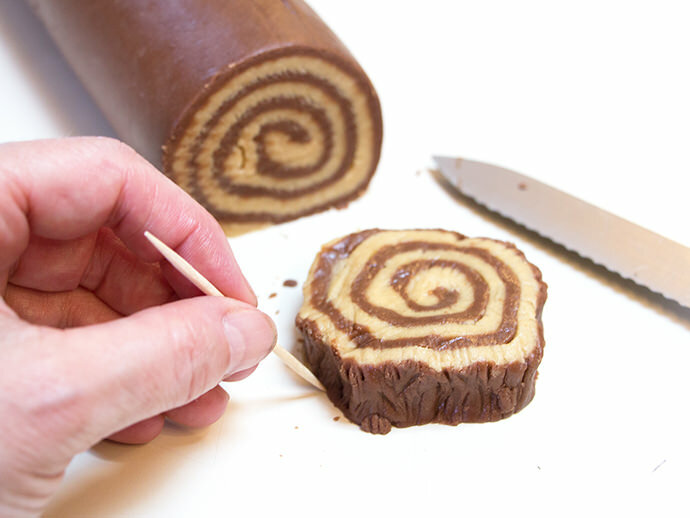 The thinner you can roll the fudge, the more “tree rings” you will get inside. 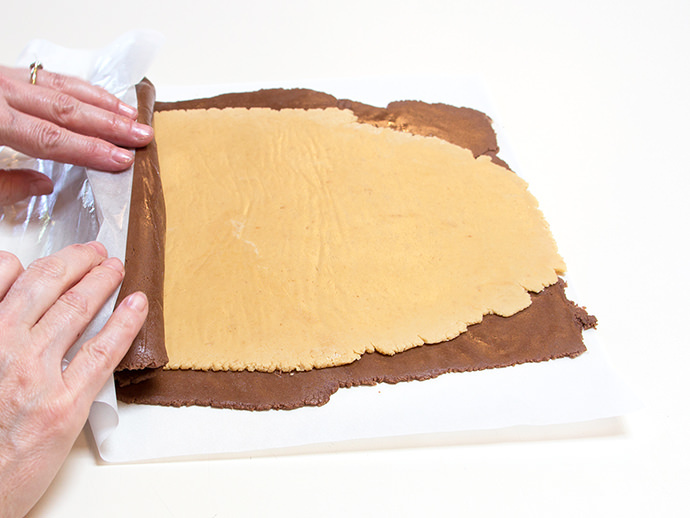 Remove the parchment from the tops of the peanut butter fudge and layer it on top of the chocolate fudge. Lift up the bottom piece of parchment and begin rolling from one edge until you’ve made a solid log. Using a serrated knife, cut off your tree slices to desired widths. To add the texture of tree bark, use the serrated knife or a toothpick to rough up the outer edge of each slice. 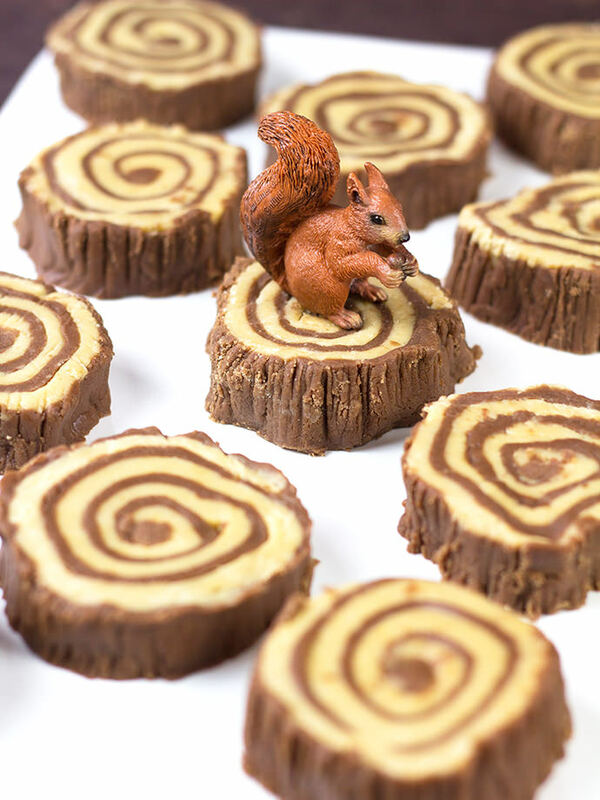 Look for fun ways to display your fudge. 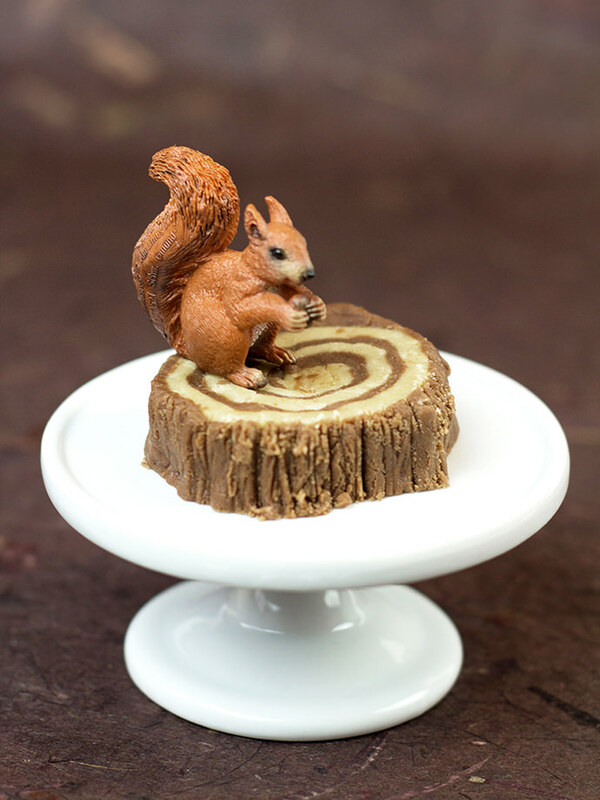 I thought this little squirrel added just the right touch! 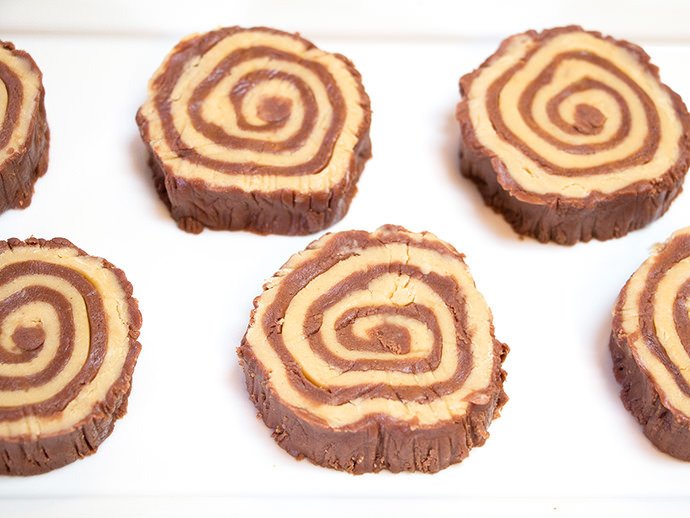 Fudge stored in the refrigerator can last 2 to 3 weeks when kept in an air-tight container. Fudge stored at room temperature in an air-tight container will last 7 to 14 days. Gah! These are too cute! Interesting….. Mine were cooling are ready to pour almost immediately after I mixed them. 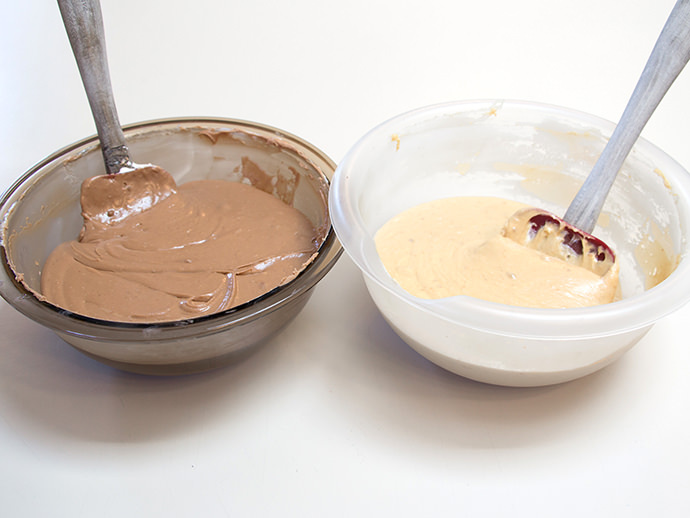 I wouldn’t wait too long – 5 minutes – or the fudge will start to set up in the bowls and be hard to roll out. I have made this 3 times now and just can’t seem to get it quite right. It is too liquidy every time and sticks to the parchment paper. It is really thin as well because of the extra liquid. Not sure what I’m not doing right. I keep boiling it for longer and longer. I’m following the instructions completely. It’s been humid lately, could this effect it? I think next time I will use less evaporated milk and see if that helps. how much chocolate and peanut butter chips-cup wise? Me too! How do you get it to be solid? Help! it describes how test the accuracy: https://www.thespruce.com/how-to-test-your-candy-thermometer-520314 Hope this helps!! When I tried to roll the fudge it broke up into small pieces. What could have been my problem. 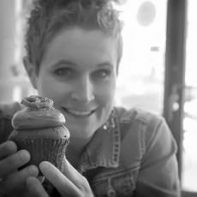 Hi Anne – It’s possible that your fudge was over- or under-cooked – we’d recommend testing the accuracy of your candy thermometer. 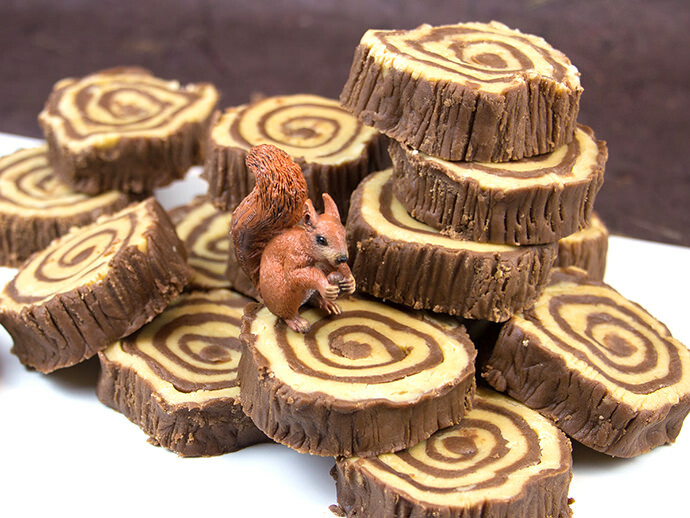 It can make a big different in your results since fudge can be tricky to get spot on! Hope that helps for next time! How long do i wait before taking the parchment paper off? I am testing it now and all the reviews say check your thermometer, i did its band new and i did it at 234. Help! I’ll take a look and get back! This looks so beautiful, though may have to modify to avoid so much sugar. Maybe plain cake with caramel?? ?